1. This represents the number of children in some form of care outside the parental home as of March 31, 2014. 2. This represents the average annual maintenance cost per child in care only. It does not include expenditures on prevention, operations, or other types of funding that serve both children in care and other children and families on-reserve. 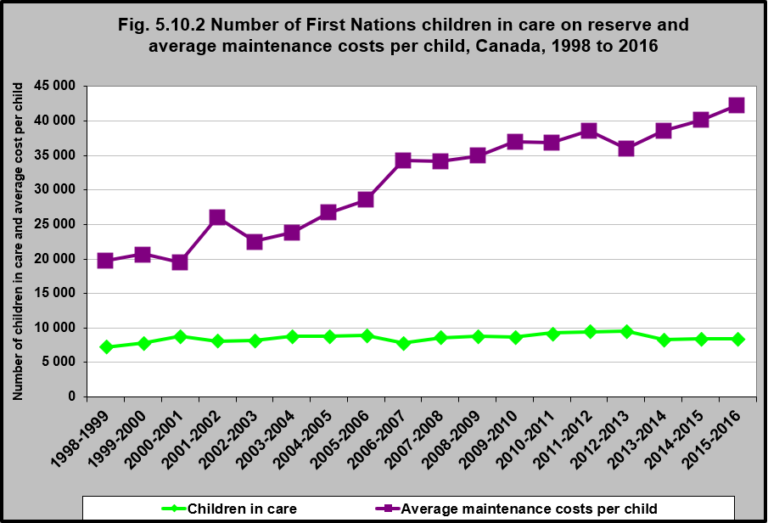 Source: CICH graphic created using data adapted from Comparison of Number of First Nations Children in Care and Maintenance Costs Per Child from 1998-1999 to 2013-2014. https://www.aadnc-aandc.gc.ca/eng/1100100035204/1100100035205 -accessed August 21, 2017. Between 1998 and 2016, the number of First Nations children living on reserve in care of the child welfare system (Foster Care, Group Home, Institution or Kinship), has increased from 7,220 in 1998/1999 to 8,483 in 2015/2016. Although the number of children in care of the child welfare system has remained constant, the average maintenance cost per child has increased significantly. In 1998/1998 to average cost per child was $19,806.09 per fiscal year. In 2015/2016 that cost had increased to $42,284.57 per child per fiscal year.